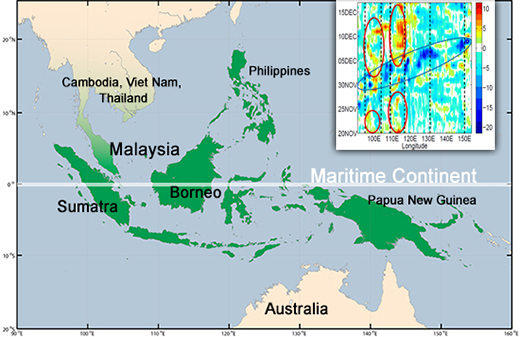 Stalling the MJO Frequent rain and storminess over Borneo in the Maritime Continent is the mark of the weather and climate system called the Madden-Julian Oscillation. Enlarge Image. Results: Seattle storms and Sri Lankan cyclones—they bear a single signature. The culprit is a cyclical churning of clouds and rain the size of Alaska called the Madden-Julian Oscillation (MJO). The MJO is a slow-moving weather pattern, traveling from the Indian Ocean to the Pacific every 30-60 days. Researchers at Pacific Northwest National Laboratory explored the forces that push this global pattern along and why it sometimes gets waylaid over a group of islands spanning the equator between the Philippines and northern Australia. The team used computer simulations and local data and found that the daily cloud pulses over these islands stalls the MJO's progress. They cause rain to fall out of the system instead of letting the MJO quickly pass over the islands carrying rain toward the Pacific Ocean. 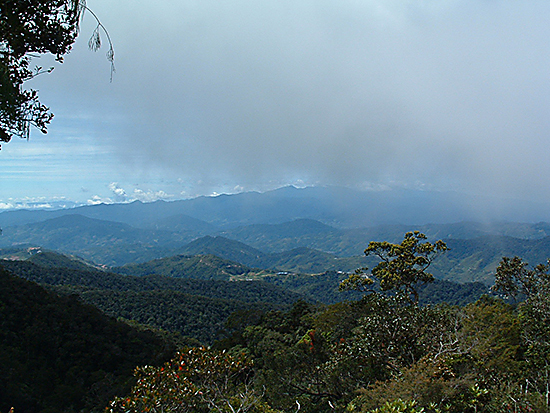 With the usual cycle, "clouds form over the equatorial islands in the afternoon, after the surface has warmed to its peak, and propagate out to the surrounding waters during the night to early morning," said Dr. Samson Hagos, atmospheric scientist at PNNL. "That phenomena results a contrast in solar heat reaching the surface." Without this day-night cycle of cloudiness in the model, the MJO sailed along without a hitch to the Pacific. However, with this cycle of cloudiness in place, Hagos explained, the MJO stalled over Sumatra and Borneo, falling as rain over the islands. Why It Matters: As a large pattern of stormy, rain-filled clouds, the fits and starts of the MJO have far-ranging effects. Much of the weather that hits the winter US western coastline finds its origins in the MJO's mass of clouds. Will the storms be heavy or light? This study revealed why some MJO episodes may cross the Maritime Continent unheeded and proceed toward the US west coast, while others stutter and lose steam. This has important implications to improve the forecast of MJO-related weather events affecting the United States such as tropical Pacific cyclones and the atmospheric rivers that pound California some years. The difference in precipitation between the two sets of simulations. The red and black ovals indicate the increased precipitation over the islands and weakened propagating MJO signal. By introducing an additional 15-30 W m-2 in surface down-wellling radiation over the Maritime Continent, the diurnal cycle of clouds favors the stalling and weakening of the MJO convection signal. Methods: The research team ran a pair of climate model ensembles-control (marked CONTROL) and no-diurnal cycle (marked NODC) during simulations of a November 2011 MJO episode. In the CONTROL simulations, the MJO signal weakened as it propagated across the Maritime Continent, with much of the convection storminess stalling over the large islands of Sumatra and Borneo. In the NODC simulations, where the incoming solar (shortwave) radiation at the top of the atmosphere was maintained at its daily mean value, the MJO convection signal propagating across the Maritime Continent was maintained. Examining the surface energy fluxes in the simulations, the researchers found that the surface net down-welling shortwave radiation (portion that could be absorbed by the surface) was larger in the presence of the diurnal (daily) cycle (CONTROL simulations) primarily because clouds preferentially form in the afternoon and are smaller during daytime in comparison to nighttime. 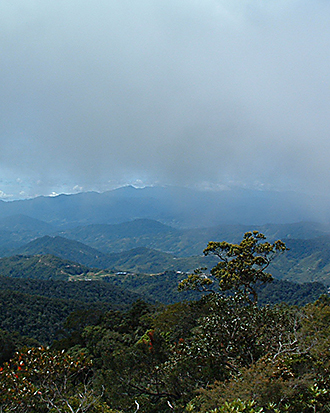 They analyzed observations from the Atmospheric Radiation Measurement (ARM) Climate Research Facility and the Tropical Rainfall Measuring Mission (TRMM) data which indicated that ahead of and behind the MJO's active phase, the diurnal cycle of cloudiness increased the downwelling shortwave radiation and subsequently convection over the islands. This boosted the stationary convection that competed with and disrupted the MJO's convective signal that circulates over the waters surrounding the islands. The study showed how variabilities in season, land-surface heating, and the El Niño-Southern Oscillation weather cycle that regulates cloudiness over the Maritime Continent, may influence an unheeded trip for the MJO. It also provides potential insight into why many global models (with poor representation of the day/night heating/cooling cycle) fail to predict whether the MJO will cross the Maritime Continent islands or not. What's Next? The next step is to examine the processes that control the daily cycle of cloudiness. The researchers hope to reveal differences among environmental conditions that allow some MJO episodes to propagate through and others are blocked. Ultimately these environmental variables will be used for applications to increase MJO system predictions. Sponsors: This research was supported by the U.S. Department of Energy (DOE) Office of Science, Office of Biological and Environmental Research (BER) as part of the Atmospheric Systems Research and Regional and Global Climate Modeling Programs, and NOAA. User Facility: The ARM Climate Research Facility at Manus for data, and the National Energy Research Scientific Computing Center (NERSC) for computing resources, both BER user facilities sponsored by the DOE Office of Science. Research Team: Samson M. Hagos, Zhe Feng, Casey D. Burleyson, PNNL; Chidong Zhang, Brandon Kerns, James J. Benedict, University of Miami; Charlotte DeMott, Colorado State University; and Matus N. Martini, Naval Research Laboratory. In one sentence: A daily cycle of cloudiness over the Maritime Continent causes the Madden-Julian Oscillation system to stutter and lose rain as it passes above, weakening the system.